Projects supporting vulnerable women and girls across Sussex have been awarded a total of £79,615 from the Tampon Tax Community Fund. This new national fund was launched in September, offering grants of between £5,000 and £10,000 to support a wide variety of projects helping the ​most​ ​marginalised​ women​ and girls ​to​ ​overcome​ ​barriers. 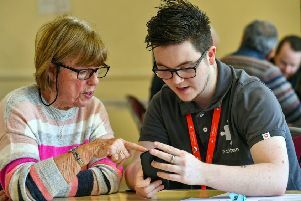 Sussex Community Foundation, which operates the fund for this area, said only a quarter of the 1,500 applications for vital projects across the UK could be supported in this first stream of funding, as all areas were oversubscribed. Sussex Prisoners Families, based in Brighton, received £10,000 to build on the success of its Hidden Voices pilot, offering new opportunities and providing a platform for women’s voices through art workshops. Tarner Community Project in Brighton also received £10,000, to provide a female-only group with an exciting range of activities, plus holiday activities and outings. My Sisters’ House CIC, which works across the coastal area in Arun and Chichester, received £9,957 towards the launch of a buddy system for women and girls who have suffered abuse and are deeply traumatised. Women’s Voice in Hastings and St Leonards received £9,500 for workshops and activities designed to bring women together, including establishing a peer network. Counselling Plus Community in Hastings received £9,000 for a facilitated group, offering six two-hour sessions for 28 women who have suffered domestic and/or sexual abuse. Safe in Sussex, based in Worthing, received £8,700 for the development of a bespoke emotional resilience and recovery programme, supporting women and children affected by domestic abuse. Safety Net in Portslade received £8,454 to provide a focused project, Girls Talk, specifically addressing the needs of girls and young women aged ten to 14, keeping them safe from harm and abuse. The As You Are Centre in Southwick received £7,010 to fund six therapeutic groups for women experiencing mental ill health. Brighton Women’s Centre, which supports women across the county Sussex, received £6,994 towards the redevelopment of its counselling service. The Tampon Tax Community Fund is money generated from the VAT on sanitary products. Community foundations were asked by the government to distribute the £3.4million of funding raised through the levy on sanitary products to small, local projects supporting women and girls. Projects that received funding in Sussex included those that will help women and girls get into or back to work, raise awareness about health and mental health issues, and support those who have experienced, or are at risk of experiencing, domestic abuse.